Whether you’ve sealed the deal on a work-from-home job or just want a place to pay bills, decking out your home office will make taking care of business easier on your mind, body and soul. Getting the right things in the room will set you up for success in all your ventures. Check out these items from Macy’s that will make a big difference in your space. Keep yourself organized with a big dry erase board good for notes, charts and brainstorming. Buy multiple colors of dry erase markers for color coding and board cleaner for when you need a…well…a clean slate. A good organizer cart like this Honey Can Do 12 Drawer model will also keep everything in its place. If your home office is part of a common room, it can be wheeled away. Window/Art/Lighting – Staring at a blank wall metaphorically when you hit writer’s block is bad enough. But sitting in a poorly lit room staring at a literal blank wall? That’s no way to get inspired or stay motivated. Try to face your desk so you can glance to your side out a window or look up at a picture of your family or a piece of art like this Teal Petals canvas by Graham Brown. Headphones – A lot of noise and distraction happen around the house, so staying focused can be tough. A good pair of headphones will block out noise and bring in tunes from Spotify or Pandora that will keep your eye on the prize. The hot pink color of these Polaroid Foldable Headphones will give you a visual lift while the music plays. Standing Desk – Sitting all day is not good for your health. And frankly, it’s uncomfortable. Get up and get your body moving while staying productive using a standing desk. This Roscoe Standing Desk is affordable and comfortable. A Really Good Chair – Instinctually, it’s hard to cough up hundreds of dollars for an office chair. But considering you’ll be sitting for around 40 hours a week, it’s an investment worth making. Look for something that’s comfortable and breathes, and one that’s right for your posture and body type. This Sherborne Desk Chair fits the bill and has dignified Old World style. A Fan – Especially important if you don’t have a window in the room, it’s important to keep the air circulating. Even if it’s a little cold outside, a room will start to feel oppressive if the air isn’t moving. It’s a perfect recipe for misery. If you don’t have a ceiling fan, check out this retro Vornado Retro Air Circulator Fan. A Pet Bed – If you’re at home, why not have your pal keep you company? Having another living being in the room can help you keep your sanity and serve as a reminder of the world outside of that office. A Timer or Alarm Clock – Set an alarm clock to remind you to take breaks throughout the day and set a firm stopping point for the end of the day. People easily push through their eight hours when they get into the zone because there is no mass departure of co-workers to snap them out of it. Work your hours, and then stop! At the very least, treat yourself to a beautiful desk clock like this Godinger Serenade Mantel Clock. Working in your home office can be a blessing, but it can also leave you feeling trapped if you don’t manage it correctly. 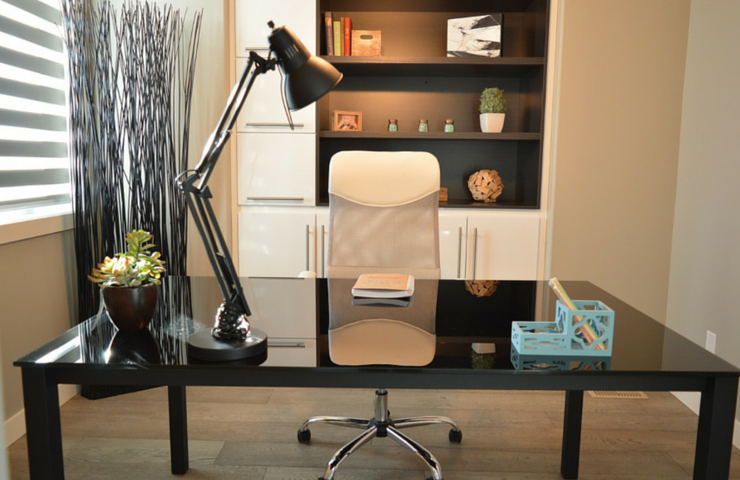 Get your home office set up for success with these important accessories!